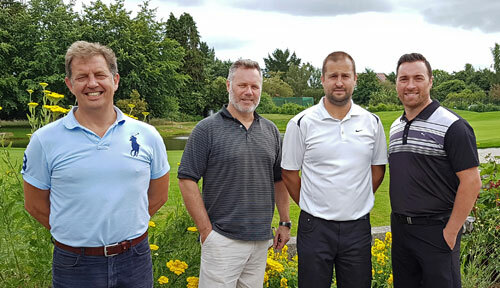 The 2nd AME match play golf challenge took place on Monday at Exeter Golf and Country Club. Matt Cotton from Wall to Wall Sunshine and Bill Farmer from Hutt River Design took on Steve Westaway and Simon House. Matt and Bill were off to a great start, going 1 up after the first hole. A chip in from Steve on the 3rd for Eagle bought it back to all square. It went one way then the next through the next few holes and it ended all square through the front 9. The 11th hole went to Steve and Simon and a great putt from Simon for birdie on the par 3 12th hole, put AME 2 up. Matt and Bill came back fighting and won the 14th to put it back to 1. A great chip from Simon on 15th to save par was enough to go 2 up and then Steve holed a birdie putt on the 16th to win the match 3&2. A great effort from Matt and Bill and some really good golf by both teams. Well done guys! After 2 matches, Mark Stanley Harris and Dave Shillingford from XME are still in pole position to win the tablets. Up next is Justin Vinney & ClaireRob Raddon from Exe Insurance and then Stuart Kew and Nigel Vaughan-ryall of Jewson. We are pleased to announce the release Issue 16 of our magazine “Tech Issue”.